Virtual Reality (VR) is a great immersive engagement tool as it directly transports the consumer into the brands world. The moment the headset is placed over the eyes the user is consumed by it and that’s an experiential marketing dream. The powerful experiences now being created by brands such as Toyota and Microsoft show the growth of this technology in the experiential world. The two have the same goal; to immerse, excite and ultimately create a brand memory. This makes it’s easy to see why so many campaigns are employing this technology. We believe that the power of this technology has much wider capabilities and should be harnessed to add extra the amplification of the initial experience. But while it is great to be take inside the brain of a brand for a few moments, can it go beyond this? For our client Road Respect, a road safety partnership in the North East, we pondered this very question. Could this technology support real meaning full behavioural change? Could it be extended beyond the 5 minute Oculus Rift experience and gain access to the digital lives of the key demographic? 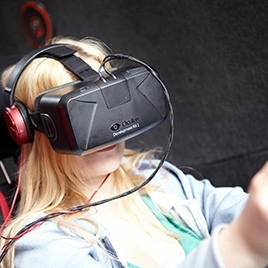 Working with tech partners we designed an Oculus Rift safe driving experience which immersed the user in a virtual world they recognised, based around key North East England landmarks, such as the Angel of the North. Driving in streets that the user knew created a real life’s experience often missing in generic driving experiences helping to embed the experience. It contains various weather conditions, hazards, and road styles all designed to help build a complete and realistic driving experience. The experience also has two modes; sober and drunk, giving the user the option of completing the drive as normal and as though virtually drunk. This option highlighted the stark difference in their driving skills under the influence with the experience ending after a crash or significant misdemeanour behind the wheel. To amplify the experience we connected it to the campaigns social media output, capturing a photo of the moment of impact and a score which is instantly shared on not only the campaigns Facebook page, but also via email to each user with the option of sharing it to their own social media channels. 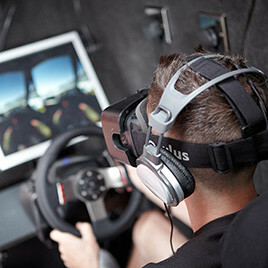 The scores were linked to an event-specific leader board, adding a gaming element to the encounter and taking the experience way beyond the average road safety simulator. Combining these elements creates a 360 experiential experience which works on a face-to-face level and lives on with the user, creating a social impact and allowing re-marketing via social media, which is paramount in any campaign focused on the millennial demographic. 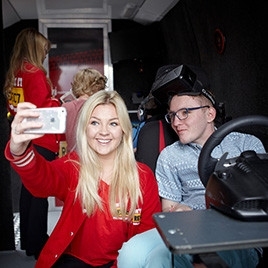 We believe that it is key that technology is not just used to create a one off experience but it’s based on a genuine need, and adds value beyond the fact that it was a fun engagement tool, when it’s used correctly it can expand reach, drive deeper engagement and support behavioural change. If you’d like to see how we used Oculus Rift for Road Respect please feel free to watch this short video by clicking the below image.